Test your skills of observation with these fun books. Each Bible story illustration has hidden objects to find. Then colour in the pictures! Ages 5+. 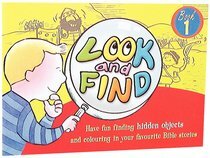 About "Look and Find (Book 1)"
In this novelty activity book, children can have fun finding hidden objects and colouring their favourite Bible stories.